Congratulations 2018 IPTA Award Recipients! Congratulations to all of the 2018 IPTA Award Recipients! The IPTA is proud to have so many members who are dedicated to the advancement of the physical therapy profession. 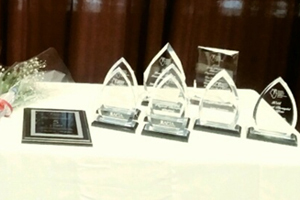 The IPTA Awards Ceremony was held in conjunction with this year’s REVITALIZE. IPTA President Mike Riley, PT and IPTF President, Sarah Jensen, PT presented several awards and recognized those members celebrating membership anniversaries! Jim Milder, PT is the recipient of this year’s Babette Sanders Leadership & Service Award. Megan Kennedy, PT, NCS was awarded the 2018 Clinical Educator of the Year. Jean Kestner, PT, MS and Kirsten Transue, PT, MPT, COMPT, OCS were both named the 2018 Physical Therapist of the Year. Sara Owens, PTA is the recipient of the 2018 Outstanding Physical Therapist Assistant of the Year Award. Samantha Caravette, SPT was recognized as this year’s Outstanding PT Student of the Year. Jason Magafas, SPTA took home the 2018 Outstanding PTA Student of the Year Award. And Representative Dan Burke was honored with the 2018 John Maselter Friend of Physical Therapy Award. The evening continued to recognize outstanding members, as the Illinois Physical Therapy Foundation (IPTF) went on to present several student sponsorships and research grants. Two Illinois researchers were each awarded $1,000 research grants. Christian Evans, PT, PhD for his research project titled “Potential Sources of Infection in a Physical Therapy Outpatient Clinic: Implications for Patient and Provider Safety” and Breanna Reynolds, PT, DPT, FAAOMPT for her research on “Thrust Joint Manipulation to the Cervical Spine in Patients with a Primary Complaint of Temporomandibular Disorder (TMD): A Randomized Clinical Trial”. Team Rehabilitation teamed up with the IPTF to award students with $2,000 academic scholarships. Congratulations to the following recipients: Jamie Kilquist, SPTA (Southwestern Illinois College); Hannah Booker, SPT (Bradley University); Michelle Kazmier, SPT (Northwestern University); Chelsea Root, SPT (Rosalind Franklin University); Alexander Gough, SPT (Midwestern University); Trace McClintock, SPT (Governors State University); and Adam Siwiec, SPT (University of Illinois at Chicago). Also being recognized at REVITALIZE were our wonderful volunteers for taking on leadership roles and dedicating their time and service, and recognition of IPTA/APTA members for their years of membership ranging from five up to 55 years! These members received pins upon checking in which were proudly worn during the REVITALIZE weekend. Click here to see who is celebrating a membership anniversary!